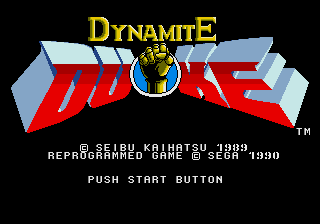 Dynamite Duke (ダイナマイトデューク) is a 1989 arcade action game by Seibu Kaihatsu. Sega acquired a license to port it to the Sega Mega Drive and Sega Master System, releasing them in 1990 and 1991, respectively. Game follows mercenary Duke "Dynamite" Fredericks as he attempts to bring down Dr. Neil Ashe, a mad scientist who is trying to take over the world by using robots. Duke's right arm is cybernetic and apparently (according to the manual anyway) ten times more powerful than a normal human. The Japanese cover of the Mega Drive version features a character who resembles the actor Dolph Lundgren, who played Ivan Drago in the film Rocky IV. During development the game was known as The Dynamite Duke, before the "The" was dropped. The game plays like a lightgun game — you are Duke, positioned immediately in front of the screen, and your goal is to go around killing everything in sight. The D-pad moves your target crosshair (moving Duke in the process) and / shoots (there is no rapidfire). You can also melee nearby enemies — / punches and (no Master System equivalent) kicks. Should a power-up appear, simply shoot at it to take it. Duke also has a special weapon called "Dynamite Punch" which is used by holding down the punch button and releasing it after Duke starts to glow. This causes massive damage to all enemies but can be used a few times in each level. Each level has a boss fight in which the player must defeat a boss character in close combat. The Master System version has less levels than its Arcade and Mega Drive counterparts. There is a secret "Super Options" screen in the Mega Drive version, which can be activated by pressing ten times, then , at the screen where "Start" and "Options" are seen. Various things can be changed from this screen, the starting level (mission) inclusive. Bullets: Increase the number of bullets Duke has. Full Auto: Fully automatic machinegun fires continuously without using any bullets from Duke's ammo pool. It lasts about a minute. Bullet Proof Vest: Duke is unaffected by attacks for a while. Bazooka: Each shot causes massive damage. 10 bullets. Extra Dynamite Punch: Increases Dynamite Punches by one. First Aid Kit: Recovers Duke's lifebar. Produced by: Seibu Kaihatsu Inc.
Main article: Dynamite Duke/Magazine articles.